Invest in the construction of the 2000 guangzhou Galaxy computer plaza Co., LTD, is a collection of shopping, leisure, entertainment, information, education as one of the major IT mall. Through nearly three years in careful management, obtained the general consumer's favor, formed a kind of guangzhou as the center, channel radiation in the pearl river delta to the situation, has a great influence in the industry. Galaxy computer plaza geographical environment, IT is located in the business circle leading location, topped with tianhe east road tianhe road interchange. The subway and bus with more flies, for breakthrough of guangzhou things hub, the transportation is convenient, to give the general consumers brought great convenience. Peripheral environment is good, the conference center, logistics, catering, bank, hotel and other supporting facilities, and for businesses to provide flexible operating space. Part of the mall a construction area of 14000 square meters, points the seven layers structure: negative for a parking lot on the second floor and warehouse; Negative for the computer city on the first floor DIY culture base; The first floor for laptop and PinPaiJi stores; The second floor for digital products heaven and earth; The third floor is our accessories world; The fourth floor is a computer supermarket, notebook quick repair center; The fifth floor for comprehensive office buildings. All kinds of facilities scattered among them, such as: leisure water, digital printing shops, fast food corridor and every corner across the plaza, the continuum of consumer rest area, let a person in the city at any time and place of meticulous care we feel. Now there are more than 400 shops in the Galaxy computer plaza between, ChuZuLv reaches 100%, the monthly rent collection rate was 100%. The marketplace positioning clear, planning ahead, attracts many domestic and international famous brands, such as: IBM, TOSHIBA, SAMSUNG, SONY, ACER, HP, lenovo, founder, QiXi, tsinghua, TCL in in succession. The department store in the assembled by the businessman is very strong, 80% of the general agent or the gold medal for the brand dealer. At the same time, because of his city with a large market with skilled operation management team, from the opening date, through the management team of effective operation, make the tianhe computer city property value rises successively, thus considerably make tianhe computer city the long-term development of the assured, make infinite glamour. 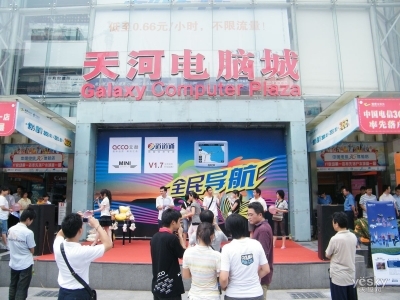 After opening, Galaxy computer plaza by advocating "transparent project" the brand new consumption idea, combined with its good hard environment and facilities, and unique management idea and advanced service consciousness, passenger and popularity surge. Through the investigation, company, degree high, the economic high income for the white-collar workers WoCheng major consumer groups. College degree or above, more than 2500 monthly income consumers accounted for more than 60% of the proportion of the total consumption. Monday to Friday on an average day 2-30000 people handled, Saturday, and every day for 5-volume, 60000 people, and the seed in the forefront of the industry.